Line 8-inch square baking pan with aluminum foil, allowing extra foil to hang over edges of pan. Lightly coat with vegetable oil spray. Toss chocolates, baking soda and salt in medium heatproof bowl until baking soda is evenly distributed. Stir in condensed milk and vanilla. Remove bowl from the heat and continue to stir until the chocolate is fully melted and mixture is smooth, about 2 minutes. Stir in the walnuts. Transfer the fudge to the prepared pan and spread in an even layer with a spatula. Refrigerate until set, about 2 hours. Remove from the baking pan by lifting the foil extensions. Using a chef’s knife, cut into squares. Makes about 2 1/2 lbs. Fudge can be wrapped tightly in plastic wrap and stored in a cool place up to 2 weeks or frozen up to 3 months. 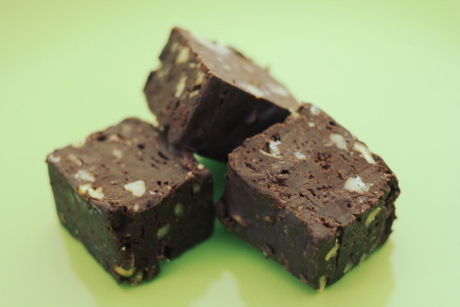 This fudge will change texture and become drier the longer it is stored. If freezing, do not cut the fudge into squares; thaw at room temp, then cut.